Manic Panic Hair Dye There are 59 products. Looking to make your new hair color stand out that little bit more? Then Manic Panic Amplified is sure to please with a huge range of exciting semi-permanent dyes. Be bright and be bold with a range of colors from one of most exciting hair dye brands out there! With 40 years of high dye experience, the makers of the High Voltage hair dye range have made the Manic Panic Amplified hair dye range that will proudly lengthen the period between hair dyes by up to 30% compared to their High Voltage counterpart. That means you can spend as much as 8 weeks with your chosen color. At Dye My Hair, we make sure that you get the hair dye you need for less. 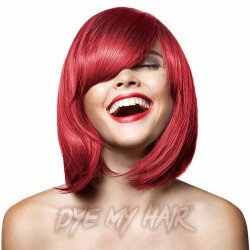 We are committed to providing cheap Manic Panic hair dye while making sure that you get the best hair dye experience. If you don’t believe us when we say that Manic Panic Amplified hair dye is best, just take a look at some of the Manic Panic Reviews and you will see just how impressive this brand has become. If you’re already a veteran of hair dyeing then you might already have an absolute favourite color that you have in mind and you might want to search for a quality shade from your choice, otherwise, you may want to make a change and try a new style. If you're totally new to the world of hair dye and managed to stumble on the best hair dye choice on your first venture online you simply have to check out this list of the most popular Manic Panic hair dye colors. Blue – If you’re on the search for blue semi permanent hair color then you have plenty of shades to choose from in this range. Choose from the lightest shades of Siren’s Song Turquoise all the way to the darkest After Midnight blue. Our website has the best blue hair Manic Panic can provide. Pink – If you’re looking for a beautiful magenta Manic Panic color effect then we recommend trying to use Manic Panic Hot Hot Pink on brown hair to get that slightly darker pink effect. 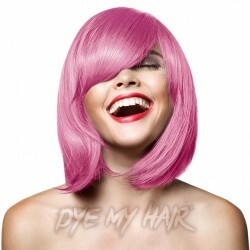 Otherwise, using the same color on bleached hair will provide a vibrant pink effect. The Manic Panic Mystic Heather hair dye is also a pretty pastel pink that is very popular right now. Red – There is no way you can go wrong with red. If you have a career that frowns on the more extravagant hair colors, getting a rich Vampire Red hair dye will give you the perfect maroon hair color that is still suitable for work. Alternatively, you can embrace the wacky with some Pillarbox red. Green – This hair color choice is definitely the right choice for anyone who loves an adventurous look. Whether it’s embracing the natural forest colors of the Green Envy hair dye or standing out in the crowd with a neon color of an electric lizard green hair dye. The choices will help you get the right look for your skin tone and personality. White – On top of all the hair dyes available in the Amplified range, we also have some Manic Panic Amplified bleach that will help you get the blonde hair that you desire as well as some Virgin Snow White Toner to make your hair the purest platinum white. If you’re not satisfied with an intense color effect then some of the Manic Panic UV reactive hair dyes will let you have UV glowing hair in the darkest room as long as you have a black light handy. This can make your already amazing hair look even better when you step into a nightclub and suddenly you’re the brightest hairstyle in the whole room. You can choose from the Cotton Candy and Hot Hot Pink, the Electric Lizard green or Siren’s Song blue for a glow in the dark hair effect. If you're still in need of persuasion as to why you should buy one of the amplified colors, then make sure to check out the celeb scene of exciting hair colors. Manic Panic boasts a huge fan base of celebrity dye hard, who just can't get enough of the stand out colors. Some of these famous celebrities have enjoyed trying out Manic Panic Amplified, and aren't afraid to shout about it! Manic Panic remain loyal to their motto "tested on celebrities not animals" - and we can already see how good the celebrity tests have turned out! All the Manic Panic ingredients used in the Amplified hair range are vegan friendly and cruelty free. With all of the top quality ethics, color intensity and lengthened color period, there is no reason not to use the Manic Panic Amplified. 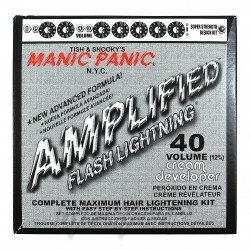 From all of the Manic Panic products available in our store, the Amplified range is easily the best value for your money while also boasting the majority of colors featured in the High Voltage range. Make your color transformation last that little bit longer with some of these suptuosly exciting shades. Are you looking for a new level of hair dyeing power? Check out Manic Panic High Voltage for the best in electrifyingly good color. The brightest in the business, these awesome tones are sure to have you showing off your locks with pride. These crazy colors are so vibrant that your hair will have never looked better. Make sure to look great every day with an ethical hair dye that has an intense new color that is sure to stay looking dazzling. Lasting up to 6 weeks, you can be sure that Manic Panic will give you full coverage and amazing color without causing damage to your hair. The Manic Panic classic cream formula will condition your hair while you color it. The Dye Hards out there will know that keeping your hair healthy and strong is the key to achieving awesome shades. If you prepare your hair with bleach before you apply the color then it is important to consider the effects that the bleach will have on your locks. As you will know bleach can dry out hair causing it to become weak and easily damaged. This is why an intensive conditioning regime should be followed before lightening your hair. It is also important to think about your shampoo choice when using Manic Panic high voltage. You may find that your color fades faster with certain brands so it is usually best to buy a shampoo specifically for dyed hair. This will help preserve your color, keeping it brighter for longer. We also advise washing your hair in colder water and avoiding using heat on your hair. All these tips will help you achieve the color you would like. It is essential to lighten your hair before applying brightly colored hair dye. Applying Manic Panic colors on dark hair simply won’t give the same effect. In order for the color to glow brightly, you will need to start with a blank canvas. If you weren’t already in love with the Manic Panic color chart, this dye has several features to help you enjoy your hair dyeing experience even more. These products are vegan friendly and are made with natural ingredients. One very unusual feature of this particular brand of hair dye is that it is safe to use during pregnancy which means you can keep your hair looking exactly the way you like it. Finally, the special formula used by Manic Panic High Voltage dye means that it is PPD, paraben and ammonia free. One of the most popular shades of the High Voltage range is Manic Panic hair dye blue, perhaps because of the color associations with lightening. It is hardly surprising that this color proves popular in the high voltage range. Even within this color, there are variations in shade. Here at Dye My Hair, we love Manic Panic bad boy blue. This gorgeous shade has purple undertones, creating a vibrant and rich overall look. If you want to stand out from the crowd this is surely an excellent way to express your own style. This color is perfect for full coverage and dip dyes. Why not highlight your hair with this crazy color for a punk rock vibe. If you are searching for a color that steps outside of the classic blue hair dye colors then check out the Manic Panic Voodoo blue Forest hair dye. This striking hue has a hint of green, giving an overall turquoise color. If you love the mermaid hair trend then this could help you earn your fishtail. It definitely evokes images of tropical oceans and sunny days. You will never need to ask ‘Where to get Manic Panic hair dye?’ again now that you have discovered Dye My Hair. This site is dedicated to all things hair dye which means you can find the best advice and products on the market. We regularly post on our social media channels and write blog posts to help you keep up to date with the latest trends and brands. You don’t have to restrict yourself to the High Voltage collection. For different styles why not explore other Manic Panic colors. There is plenty to explore with ranges of pastel hair dyes, UV hair color and temporary hair gels. Find the product to suit your hair coloring needs! You can see why we love the Manic Panic High Voltage collection. We think the brighter the better when it comes to hair. Why stick with ordinary colors when you could be sporting a head of glorious green or perfect purple? We love to help you create a unique look that suits your style and we are confident you will be able to find that perfect bright tone with the Manic Panic high voltage range. Are you searching for the perfect pastel ‘do? The Manic Panic Creamtone range is not to be missed if you are trying to get the perfect balance between a vibrant new color and an adorable pastel hue. These gorgeous shades are perfect if you are looking for soft pastel colours and are sure to match the rest of your pastel wardrobe. The trend for perfect pastel colors in all aspects of fashion and beauty emerged in early 2017 and we think it’s here to stay. From makeup to clothes to hair, there is nothing you can’t turn a cute pastel shade with this fun trend. With plenty of colors to explore in the Manic Panic colors collection, we think you will find your dream hair color here at Dye My Hair! The first thing you will need to do is make the choice of which color you would like. Of course, you don’t just have to select one. A two-tone pastel style or a full rainbow ‘do are both great options. First, we have Manic Panic Creamtone Sea Nymph. This minty shade of green is perfect for those mermaid moments. It isn’t quite as pale as a full minty green shade which is what gives it the aqua and seaweed tones. This pastel hair color is guaranteed to make you stand out for all the right reasons but you will need to put plenty of thought into your wardrobe choice. We know you are all experts at picking out the perfect outfit. A classic color combo is pink and green. Add a hint of pastel pink to your outfit for a cute summer style. If you want something a little edgier try a grey or charcoal top or stick to a white top with a cool design. If it is pink you are planning on trying then you will want to take a look at the Manic Panic Creamtones Fleurs Du Mal. This millennial pink shade is the classic baby pink. If you are looking for that sweet shop, candyfloss vibe then this color is perfect. This shade works especially well when you style your hair in bouncy, soft curls. For the complete pink style why not pair this color with a cute pink dress. Remember these styles look best if you start with the lightest shade at the top and work down to a darker shade of pink for your shoes. This colour also looks great with a pop of grey, light brown or white. One of the most popular colors of Manic Panic hair dye is the Manic Panic Creamtones Dreamsicle. This peachy shade is a blend of orange and pink. It almost follows the trend for rose gold hair colors and will work especially well with a blonde or light base color. Use as a dip dye, highlights or for full coverage. Adding a touch of blue to your outfit can really make your new color shine through. This shade isn’t just for light colored hair. Manic Panic Dreamsicle on dark hair is also a popular choice and gives a more edgy vibe to this color. Leaving your dark roots peeking through can look awesome but remember if you don’t lighten your hair before using this dye the color won’t shine through as brightly. One of the most popular shades from this Manic Panic collection; there are plenty of Manic Panic Dreamsicle reviews to check out online so don’t just take our word for it! This is also a great place to search for style inspiration to pair with your new hair. Embroidered patches on T shirts and jeans in bright colors are sure to look awesome when paired with this look. Don’t be afraid to experiment with bright clothing and remember that often clashing colors can look awesome. Best Pastel Hair Dye With Dye My Hair! If you are looking for a purple shade that isn’t quite as bright as Manic Panic Rose then why not consider a lilac or lavender shade? This pure purple delight doesn’t have the same pink tones as a rose but is sure to help you stand out from the crowd! The Manic Panic Creamtones Velvet Violet Hair Dye will have you wishing you had tried this shade sooner. If you are worried lilac hair will make you look too ‘preppy’ then why not leave darker roots or create an ombre effect with a darker shade? Pair with dark colored clothing for a more punky style or go for a full pastel makeover. The final shade is Manic Panic Creamtone Blue Angel. Blue has been a hugely popular unusual hair color for quite some time now so you need to get inventive with different shades if you want to stand out from the crowd. Manic Panic provides a vibrant yet pastel shade of blue that will give your hair a gorgeous bubblegum blue shade. Not so sure about lightening your already dark blue hair? Check out a Manic Panic Creamtones review. Plenty of YouTubers have been trying these shades. Again, this color can look awesome with darker natural hair showing through but remember to bleach the sections you do want to dye for the best results. This shade is a cool way to create a bright colour streak in your natural hair if you aren’t ready to dye all your hair. As you can see the five shades of Manic Panic Creamtones are completely different from each other so whatever color you are searching for this could be the perfect pastel range to try out. You could even work your way through all the different shades or try multiple colors at once! Complete your look in true pastel style with the Manic Panic Creamtones Perfect Pastel Hair Dye in Blue Angel! Discover a new glowing red shade with the Manic Panic High Voltage Classic Cream Formula Colour Hair Dye in Wildfire! Pastelise your locks in style with the Manic Panic Creamtones Perfect Pastel Hair Dye in Velvet Violet, a must have for any Dyehard! Are you in the market for some guilt free glamour? Want hair dye that’s bright, bold, beautiful and completely cruelty free? Then you’re guaranteed to love our collection of Manic Panic hair colors! With a veritable rainbow of temporary stunning shades available, whether you’re looking for pretty pastels, vivid neons, UV reactive hues or vibrant primary colors, you are guaranteed to find the right Manic Panic hair dye for you when you shop with us! Undoubtedly one of the most iconic and beloved hair dye brands of all time, Manic Panic has a pretty inspiring origin story to boot! Founded in 1977 by sisters and former Blondie backing singers Tish and Snooky, the brand started life in a small boutique in New York’s infamous St. Mark’s Place, catering for the punk scene. As the store’s reputation grew, so did their range of products! Taking their cue from their own personal style and that of their quirky customers, Manic Panic was among the first brands on the scene to introduce a huge range of electrifyingly bright color hair dye. The demand for the brand’s unique selection grew exponentially over the years, leading to a huge boom in popularity in the 1990’s with celebrities and the high fashion scene favouring their products. This level of exposure and popularity lead to a swift and sudden increase in media exposure, resulting in the brand taking on industrial scale production for the first time ever. Remaining every bit as popular today, the brand is now available all over the world and in more colors than ever before! With celebrity fans such as Katy Perry, Hayley Williams, Jared Leto and Grimes, the Manic Panic color chart is a perennially popular range for fans of unusual looks. Can’t decide which type of Manic Panic hair dye to go for? Confused about which formulation is right for you? Fear not, we’ve got your back! Amplified: If you want hair color with extra intensity, then this is the range for you! Lasting up to 30% longer than other Manic Panic hair dye formulations, the Amplified dyes deliver 6-8 weeks of bright color. Creamtones: The Manic Panic Creamtones range features several pretty pastel shades that deliver pale perfection straight out of the tub. With no mixing required, these soft and beautiful colors are ideal for achieving an instant transformation! High Voltage: The Manic Panic High Voltage range is the classic, original product that made Manic Panic famous. With up to 6 weeks of funky color per application, this formulation is available in more than 30 different shades, so you’ll be spoiled for choice! Plus, Manic Panic has semi-permanent hair dyes, a great choice for anyone seeking intense color without a long-term commitment. If ethical and cruelty free beauty is your bag, you know it can sometimes be pretty tricky to get hold of products that look great, feel great and don’t cost the earth. However, that’s not a problem with Manic Panic, because all of their hair dyes are vegan friendly hair dyes and are made with ingredients that are not tested on animals. Plus, their dyes are all affordably priced, so you can switch up your style as often as you like without breaking the bank. So, if you’re wondering where to buy Manic Panic hair dye, you’re in the right place! We’ve got a massive selection of colors to choose from (Including the ever-popular Manic Panic Hair Dye Purple and Manic Panic Atomic Turquoise shades), plus extras like bleach kits, hair gels and pastel-izers to make sure that you can grab everything you need to create a colorful ‘do all in one place. Want to know how to use Manic Panic? Then check out our handy hints and tips to help you to achieve total color perfection! ALWAYS make sure that you perform a patch and strand test at least 48 hours prior to coloring your hair. Although Manic Panic is PPD free and made without ammonia or peroxide, it’s still crucial to perform a skin test to ensure you’re not allergic to the product. The strand test will allow you to calculate your ideal development time, so that you can guarantee to get the perfect color! If you are pre-lightening your hair, ensure that you’ve used a toner to neutralise brassiness and create an even base before you dye. This is especially important if you’ve applied bleach on dark hair or you’ve opted for a very light shade of hair dye. Alternatively, make sure you've purchased the right Manic Panic Hair Dye for Dark Hair so you can get the desired color effect. 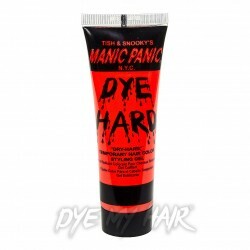 Always apply Manic Panic dye to dry hair! You can use tint brushes for precision application or apply using your hands for a more free-form effect. Once you’ve covered the hair, comb the dye through until it begins to go frothy (This means the dye’s been absorbed by the hair) and allow to process. A minimum processing time of 30 minutes is required, though if your hair is especiallycolor resistant, pop on a plastic development cap and leave for 60 minutes or more to process. Once the dye’s finished developing, rinse the color out with cool water, then dry and style as normal! And there you have it, a fool-proof recipe for amazing looking hair! If you don’t fancy reaching for the bleach, then you can still achieve a stunning result on darker hair, simply by choosing a shade that’s suitable for use on unbleached hair. For example, if your hair falls between a 1 and a 4 on the levels system, you should opt for deep shades of blue, red, purple and green, as these hues will provide dimension and color. If your hair is between a level 5 and a level 8, you can use brighter shades, though the effect will be much less intense than if you’d applied it to bleached locks. Re-Sealable Packaging: Unlike many other hair dye brands, you don’t have to ditch your leftover color. Simply replace the lid on the remaining dye and you can save it until your next dyeing session! Conditioning Color: As Manic Panic is free from drying chemicals and hydrates and ‘fills’ the hair shaft as it processes, it has the benefit of conditioning the hair as it colors. This means it's suitable for use on even on hair that’s a little damaged and frazzled. UV Reactive: Selected dyes feature pigments that glow under a blacklight or in ultraviolet lighting conditions. Perfect for getting your glow on and lighting up the night in style! Looking for a little Color Inspiration? Then why not check out our Blog? Jam-packed with hundreds of amazing hair colors and styles so you’re sure to find the style of your dreams!